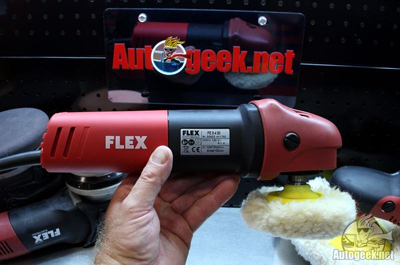 NEW FLEX PE8 Lightweight 3 Inch Rotary Polisher NOW AVAILABLE! You are here: Home / PBMA News / NEW FLEX PE8 Lightweight 3 Inch Rotary Polisher NOW AVAILABLE! The FLEX PE8 Lightweight 3 Inch Rotary Polisher is a purpose-built polisher designed specifically for small, intricate body panels. 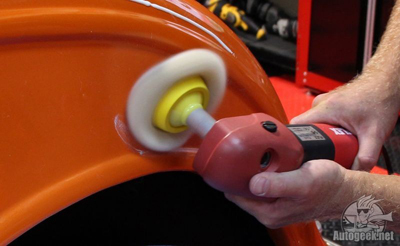 The FLEX PE8 Lightweight 3 Inch Rotary Polisher is far less cumbersome than a full-size rotary polisher, making it the ideal choice for spot repair, motorcycle detailing, and other applications where size matters! The FLEX PE8 Lightweight 3 Inch Rotary Polisher is lightweight, easy to hold on to, smooth, and powerful. 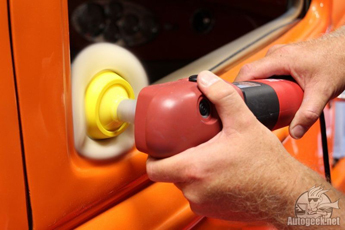 Professional detailers know that it’s impossible to get by with just one or two tools, which is why FLEX took it upon themselves to design, engineer, and create a polisher specifically for polishing small, intricate body panels and motorcycles. 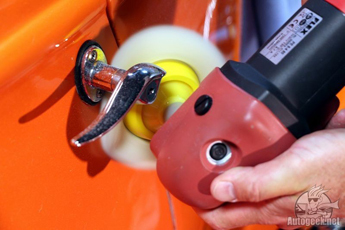 While it’s true you can equip a full size rotary polisher with a smaller backing plate, the physical size and weight of the tool makes it difficult to see exactly where you’re polishing. The FLEX PE8 Lightweight 3 Inch Rotary Polisher is a purpose built tool that will quickly become an asset in every detail. The FLEX PE8 Lightweight 3 Inch Rotary Polisher has the German quality you’ve come to expect from FLEX tools. The rugged motor operates between 1,300 and 3,900 RPM while staying cool in the process. Whether you’re detailing boats or cars, the FLEX PE8 Lightweight 3 Inch Rotary Polisher has enough power to remove oxidation and swirl marks without breaking a sweat. The FLEX PE8 Lightweight 3 Inch Rotary Polisher is perfect for surgical buffing, headlight restoration, motorcycle detailing, glass polishing, and more! The FLEX PE8 Lightweight 3 Inch Rotary Polisher has shut-off carbon brushes. When the carbon brushes wear down, the motor automatically shuts off to avoid damage. This is one of the many features that sets FLEX polishers apart from lesser tools. Shown with Rotary Backing Plate Extension (Sold separately).